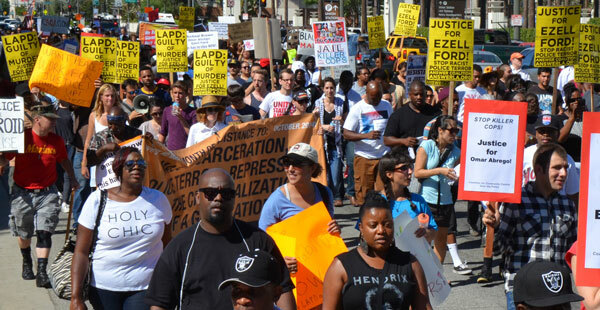 On Sunday August 17, over 800 people rallied and marched in downtown Los Angeles against racist police killings from LA to Ferguson Missouri. 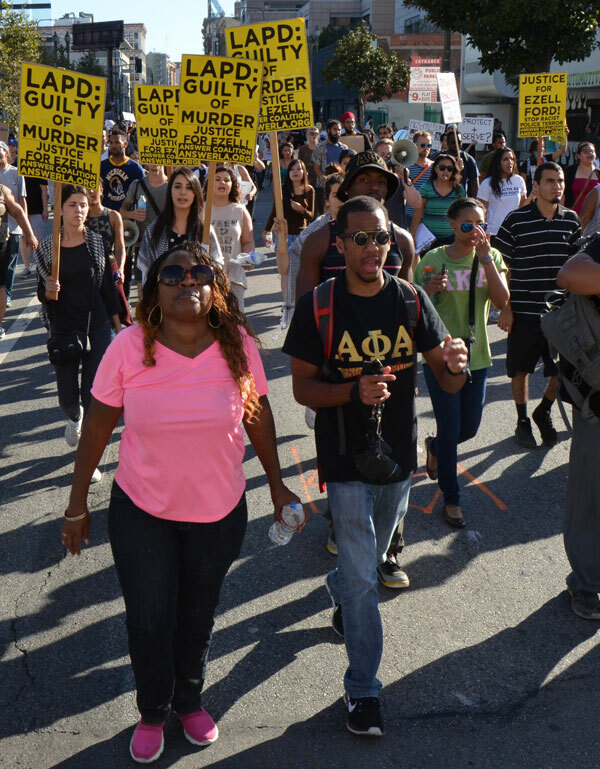 The rally began at the Los Angeles Police headquarters and marched through several crowded areas bringing a message of resistance and struggle. Many many onlookers expressed solidarity with the march. The police murder of Ezell Ford, a 24 year old mentally disabled African American youth, was the spark that lit the anger seething across LA. Communities are fed up with racism, police brutality, unemployment, poverty, cut backs in city services- all amid vast wealth for a few. Ezell was shot in the back by two officers while he was laying on the ground. 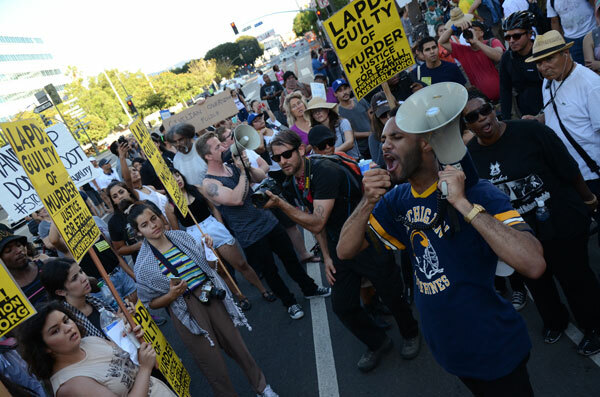 The march left the LAPD headquarters and marched to Union Station, a major transportation hub in LA, where a sit-in was held at the entrance. The march winded through Downtown, shutting down major streets, holding sit-ins at several intersections. Palestinian youth and supporters of the struggle in Gaza came out this afternoon in solidarity against racist police brutality in the United States. Capping off a week of protests in the community where Ezell Ford was murdered by police, this demonstration took it right to the police headquarters and the command staff in charge. The people demanded not just answers but also justice! At the heart of many of the chants was solidarity with the rebellion in Ferguson Missouri which is at the cutting edge of challenging an epidemic of police killings. Tonight, August 17, the police are attacking the people of Ferguson Missouri again. Tear gas, rubber bullets and brutality are being used against people who simply demand justice and refuse to be silenced. 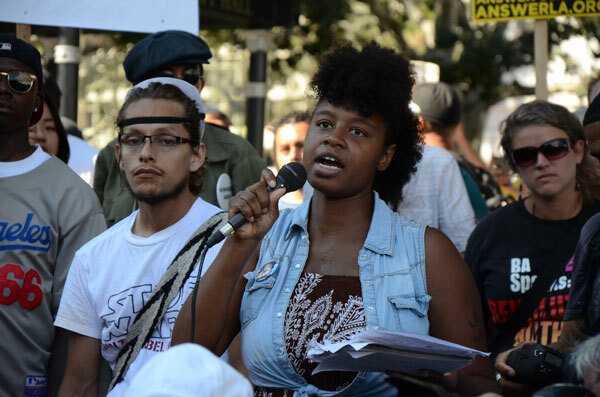 Read the eyewitness report of the struggle in Ferguson by clicking here!